When truth doesn't make sense, will lies prevail? Cathy Cramer is a former lawyer and investigative blogger who writes commentary on high-profile homicides. When she finds a threatening note warning her that she's about to experience the same kind of judgment and speculation that she dishes out in her blog, Cathy writes it off as mischief...until her brother's wife is murdered and all the "facts" point to him. The killer has staged the crime to make the truth too far-fetched to believe. Working to solve the murder and clear her brother's name, Cathy and her two sisters, Holly and Juliet, moonlight as part-time private investigators. Juliet, a stay-at-home mom of two boys, and Holly, a scattered ne'er-do-well who drives a taxi, put aside their fear to hunt down the real killer. Stakes rise when their brother's grieving five-year-old son is kidnapped. As police focus on the wrong set of clues, the three sisters and their battered detective friend are the only hope for solving this bizarre crime, saving the child, and freeing their brother. 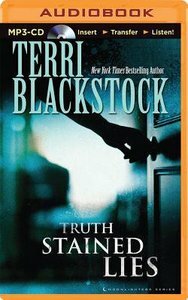 About "Truth Stained Lies (Unabridged, MP3) (#01 in Moonlighters Audio Series)"
Order now to secure your copy when our stock arrives. Other edition is available. 9780310283140 0 Available. Expected to ship in 5 to 6 weeks from Australia. Order now to secure your copy when our stock arrives. Other edition is available. 9780310332367 0 Available. Expected to ship in 6 to 7 weeks from Australia. Order now to secure your copy when our stock arrives. Other edition is available. 9780310332367 0 Available. Expected to ship in 5 to 6 weeks from Australia.